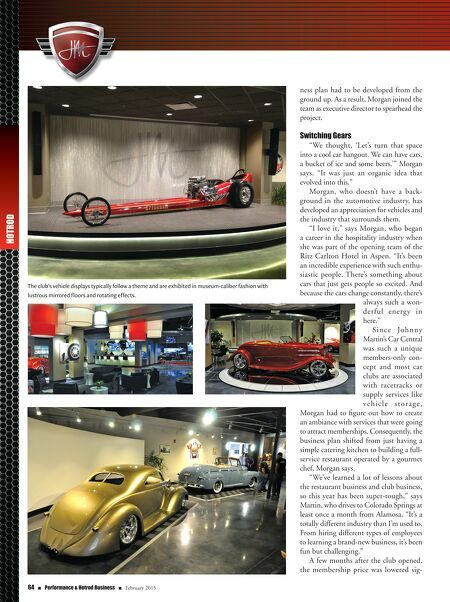 February 2015 n Performance & Hotrod Business n 65 nificantly. Morgan says $3,000 to join and then a $100 monthly fee was just too high, and lowering the price made a huge difference. "We went from 100 members at the beginning of September to over 300 in four weeks," she says. "What that tells me is that price was a barrier for people to join. The second we reduced the price, we had an influx of members." Figuring out the club's audience was also a big factor in Car Central's growth— something businesses of all kinds, includ- ing shops, could benefit from deciphering. "You have to understand who your audience is and offer them a reason to be there," Morgan says. For Work and Play The club's restaurant is open for lunch and dinner and hosts a variety of events, including cooking, car detailing and per- formance-driving classes, wine tastings, racecar simulator tournaments and movie nights for kids. A partnership with the nearby Pikes Peak International Raceway, which has a special room for Car Central members, gives racers an opportunity to use the track. From greeting members by name to taking menu requests, Johnny Martin's Car Central is focused on offering personal- ized service and supplying a comfortable hangout for all. "My biggest challenge now is when people hear car club, they think it's just for car enthusiasts and it's all about cars," Morgan says. "I want to get the message out there that it is so much more." Members also have the opportunity to consign their vehicles at Johnny Martin's Car Central and use the facility as a meet- ing space, a place to do business and net- work with others in the industry. "I look at it as a social club that's geared around cars," Morgan says. The club's vehicle displays typically fol- low a theme and are exhibited in museum- caliber fashion with lustrous mirrored floors and rotating effects. Previous themes have included Pikes Peak Hill Climb vehi- cles, Porsches, Indianapolis 500 racecars, Corvettes and Model Ts. While she was developing the business, Morgan was very focused on making Car Central a place for men and women. "One thing that was very important to me in the beginning was that this wasn't a man cave," she says. "This is a place for so many different people. It's not about men or women. It's about bringing a really unique perspective into the car world." Johnson and his wife Susan, passionate philanthropists, championed the idea to make Johnny Martin's Car Central avail- able for nonprofit events. The facility hosts multiple nonprofit events a month and has worked with organizations such as Goodwill, Children's Literacy Center and the Wounded Warrior Project. "We like to be active in our commu- nity," Morgan says. "And every time you have an event that brings people in who haven't been here before, it's a great mar- keting opportunity." New Perspectives Martin says the club has even opened his eyes to new perspectives and given him the opportunity to meet people outside of his circle. "It's been interesting for me as a hot rod guy to talk to guys that do the Pikes Peak Hill Climb," he says. "Without the club there, I probably wouldn't be in the position to be around those guys because everybody kind of runs in their own cir- cles. So that's probably been the most fun part for me—to meet some of the guys that I probably wouldn't have met if it hadn't been for the club." 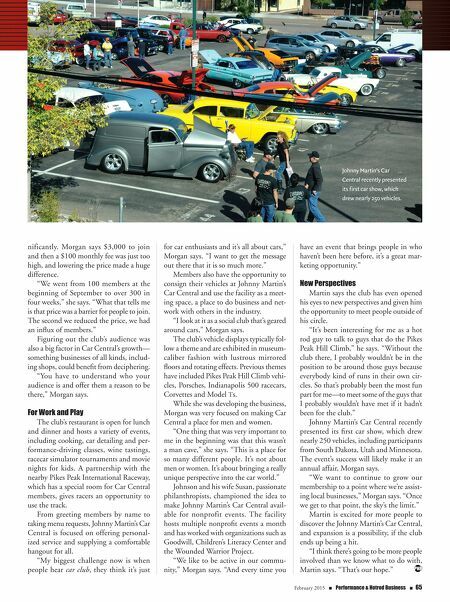 Johnny Martin's Car Central recently presented its first car show, which drew nearly 250 vehicles, including participants from South Dakota, Utah and Minnesota. The event's success will likely make it an annual affair, Morgan says. "We want to continue to grow our membership to a point where we're assist- ing local businesses," Morgan says. "Once we get to that point, the sky's the limit." Martin is excited for more people to discover the Johnny Martin's Car Central, and expansion is a possibility, if the club ends up being a hit. "I think there's going to be more people involved than we know what to do with, Martin says. "That's our hope." Johnny Martin's Car Central recently presented its first car show, which drew nearly 250 vehicles.